Scariest Places on Earth is a television show that debuted in 2000. Scariest Places on Earth is hosted by Linda Blair. Every week a different family participates in this ghost hunting adventure. The families are unaware of the location they will be hunting. They're destinations may include haunted castles, haunted homes and haunted graveyards. Once they arrive at their haunted location, they are greeted by a gentleman. This man informs the family about their location's ghostly activity. He makes each family participate in a ritual to summon the ghosts on the property. These rituals include chants, drinking blood, and reading scripture. Rituals are to protect people from evil forces that may follow or influence an individual. Once the ritual is done seriously, and properly, then the investigation can begin. Each member has to go into the haunted location only with the cameras attached to their heads. They keep in communication with each other through walkie talkies. Each member is given specific instructions over the walkies. Each individual has a different area to investigate, and each person has a different task to accomplish. The tasks may include calling out to the ghosts, staying in an area for a given period of time without communication, and reading texts that may anger the spirits. If one person out of the group is too frightened to continue ghost hunting, then the family must go home immediately. Once everyone has accomplished their designated assignments, the family reunites at home base. After everyone is reunited, the family as a whole, must now investigate the whole property together. While investigating, they must use the ghost catching equipment to interact, and document anything that is paranormal. At the end of the investigation, the tour guide comes back to the family. Before they go home, the guide must reverse the ritual, so the family won't bring entities home with them. The family then is congratulated on their survival of the Scariest Places on Earth. One unlucky family gets the unfortunate task to tackle Bathory Castle, home of the infamous Blood Countess. Scariest Places on Earth is currently available to watch and stream on FreeForm. 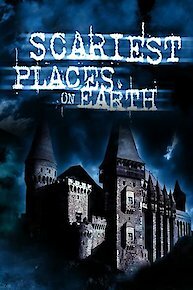 You can also buy, rent Scariest Places on Earth on demand at iTunes online.